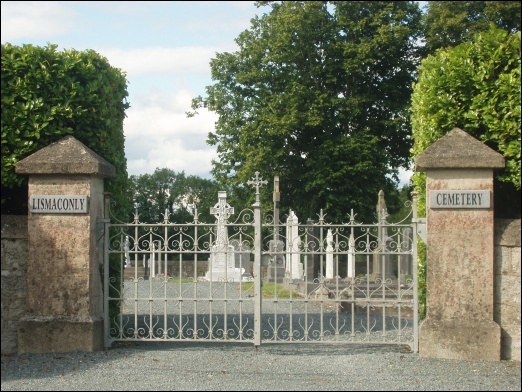 Lismaconly Cemetery is situated more than half a mile outside Myshall village on the Carlow Road. It is one of five in the Parish – Adelaide Memorial Church Cemetery, Church of the Holy Cross Cemetery, and St. Finian’s Church Cemetery (known locally as the ‘old graveyard’), all located in the village and Drumphea (which is about two miles distant). Lismaconly Cemetery opened in 1912 and the remains of more than one thousand people are now buried there. Owned by Carlow County Council, the Cemetery is now maintained by Muintir na Tire Cemetery Committee, the people of the parish and the relatives and friends of the deceased, after a spell of maintenance cut backs by the council in the 1980’s. A lot of voluntary labour helped to rescue this cemetery from neglect – modern improvements such as moving the Calvary back for Hearse access and the wreath and glass jar recycling units were deemed necessary by the committee and have been very well received. A new Calvary was donated by an anonymous benefactor and many volunteers give their time and energy to keeping Lismaconly Cemetery clean. In 2006 we were very proud to win first place in County Carlow Councils Burial Maintenance and Award Scheme. St. Finian’s 13th century Cemetery took first place in the older cemetery section and everyone in the parish was proud and delighted that our respect for those who have passed away before us was recognised by our local authority.